Last call for holiday orders! There's still time to shop handmade. Keep reading for important deadlines. The deadline to purchase made to order items (most everything on my website) is 12/14. If you want your pick, get shopping! The last day to purchase in stock items is 12/18. Items will ship via USPS priority by the 20th to ensure delivery by the 24th. Items you have seen on Instagram or in person are also for sale. Contact me to schedule a studio visit or pricing on these pieces. Last day for pick ups and visits in my Lowell studio is 12/21. Help me celebrate my new space! Bring your friends, family and pets. Eat some food, have a beer, watch a demo, see some bling. Can't wait to meet y'all! A new shipment of pyrite arrived at 105. This means my fool's gold necklaces and earrings are available again. fool's gold necklaces are now available in 16" or 18" chains! I can't wait to get back to making these. If any of my wholesale customers want them back on your shelves contact me to place an order. Some shiny objects were sent over to my neighbors Groton, MA. Get out, shop small and buy handmade at FACETSetc! After a long summer of moving I am ready to get my shine on. My shop is open and ready for business. I look forward to spending hours at my bench making piles of silver dust. Thanks for your patience this summer. As always, I couldn't do this without your support. People who buy handmade are simply the best. used my beloved saw frame to size some bracelets! made good use of my vice and bracelet mandrel. I LOVE this stump! It is so exciting to be back at my bench. 105 is coming along nicely. 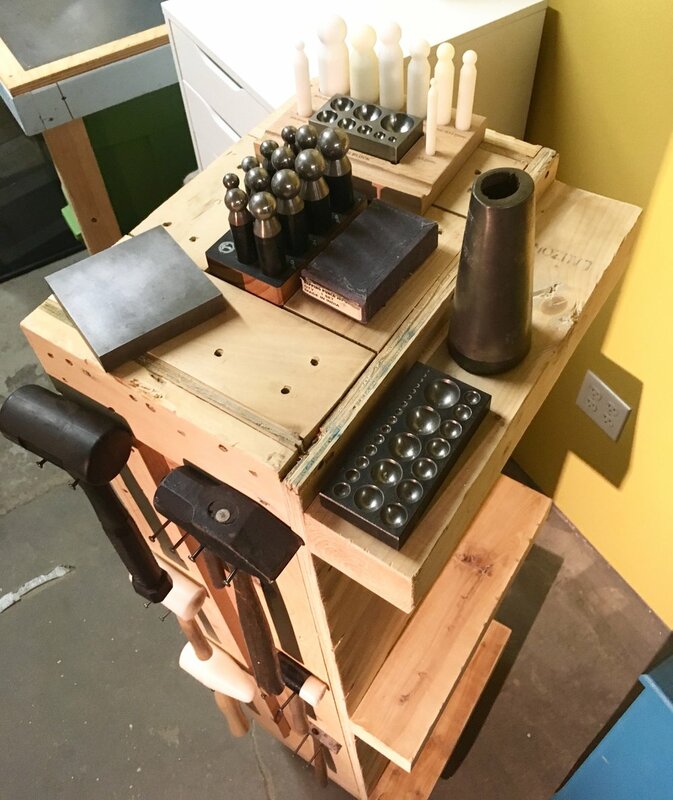 Since there is foot traffic over at Western Ave Studios I decided to take the time to put my tools on display so visitors can a glimpse at my jewelry making process. This took a lot planning as I need it to be functional and aesthetically pleasing. After some work days I wonder why I hadn't done this sooner. Not only does seeing my tools make me want to use them more creatively, but it also gives a better flow to my work process. my rolling mill has been installed on my favorite stump! I wanted my dapping tools (not seen are mandrels and a hammer) handy. a thrifted leather belt and some screws did the trick. I have made leaps and bounds in my progress. Rather than inundate you with one long post I will check in with more updates. My hammer and tool cabinet is complete and nestled in nicely with my anvil and stumps. I found this shipping my crate in freespace at WAS. It had some stickers and tape on it. Being a jeweler, I care about the details and wasn't about to settle for anything less than perfection. So, I started sanding. Maybe I'm lazy, maybe I'm brilliant, (maybe I wanted a dance partner), either way I wanted this cabinet on wheels. From the top. I had this crazy idea that my bracelet mandrel should set into the shelf in the back. That crazy idea, it led to me looking like this. When you make do with the not so right tools for the job it gets messy. TA-DA! I think getting dirty was worth it. I love this thing I made. Seeing my tools will remind me of what I am capable of. It will inspire me to explore and create more. I'm looking forward to my adventures in 105. Little by little studio 105 is coming together. It's been about a year and a half since I first dragged this stump to my old third floor space with the help of one of my best dudes. Now that it's settled easily in my first floor studio I finally mounted my vice to it. Why are didn't do this sooner, I have no idea. My work table for soldering and enameling is set up and ready to roar. A jeweler's bench isn't complete until you've mounted a bench pin. Thanks to some amazing customers I already shipped a couple of orders from Lowell! It felt great to shine up some earrings in my new space and utilize my new packaging area. 105 is starting to feel like home. There's still some boxes that need unpacking but my tools are ready to make stuff again. My shop is open and ready for business. In Stock! items ship in 1-4 business days, all other items have a 1-2 week fabrication time. Moving day (days) happened and all of my work benches, tools and well, a whole lot of stuff is piled into space 105. Team Bondcliff completed mission move k.o'brien jewelry to WAS. I had some amazing friends come by and help me set up some work tables. I am THE luckiest gal! My new studio space was a blank canvass and I couldn't help but add some color.... that's my job after all. Quite the contrast, I'm still undecided on how it looks. After a few trips to my car to get painting supplies, I realized my walls match the pansies by the brewery. There's much more to be done but 105 already feels like home. One full van trip started my official move to Western Ave Studios. After carrying boxes down from my third floor space in Pawtucket wheeling everything to my new first floor space felt like a dream. This guy made all the packing and heavy lifting seem effortless. More updates coming soon! I'm really excited to set up in Lowell. Two years ago I set foot on my first trail in the White Mountains of New Hampshire and celebrated my birthday at 6288' on Mount Washington. At the summit we were in the clouds but that didn't stop me from smiling. Though my hike wasn't easy I loved every step. My eyes took in sights I knew I would never see at sea level and with this realization I decided to set a goal to hike all of the 48 4000' mountains in NH, as many hikers in the northeast do. I am currently at number 30 and am in constant awe of all the beauty I see on the trails and summits. This collection of enamels is inspired by the colors I have seen on the trail. Granite colored rocks are accented with shades of lichen so bright it looks surreal. Nature is a true artist. This is the start of a new series called summit this way. What started with capturing the colors I see on the trail will morph into re-creating shapes in metal, playing with more colors on a larger surface, and finding a way to create the textures of the Whites into metal. It seems fitting to have all of these ideas coming to fruition as I am packing up my old studio to move into a new place. A whole new trail is at the ready for me to explore. These necklaces are part of my 30% off sale. Use code MOVINGSALE at checkout. I have some big news for my little business. In July I will start making piles of silver dust at Western Ave Studios in Lowell, MA. It is a dream come true for me to be able to work in an old mill building with a few hundred talented artists. Sitting at my bench or hammering on my anvil is solitary work so it will be a welcomed change to have so many creative souls around. I am going to miss my little state. Pawtucket is where my business grew its roots seven years ago and it will always feel like home to me. I am grateful for all the friends I met there, the sunsets I gazed at from my bench and the orders I shipped out from my RI zip code. Thank you so very much for supporting my little handmade business. I look forward to settling into my new space and making some new shiny objects for you. one of my favorite shops got a new shipment of bling earlier this month. ZIP-DANG has some earrings and as of right now they can only be found in their Wisconsin store. It is always a pleasure to work with shop owners to make bling that captures their vision and appeals to their customers. Thanks to Natalie for giving me a nudge to shake things up a bit! onyx, fuchsia, pyrite, silver, carnelian and gold OH MY! this will be the last of my wholesale orders shipping from my sunlit studio in Pawtucket. more on this news later. Have any ideas for custom work? Contact me and see if we can make it happen! There's some new jewelry in the shop and it is on SALE! a monochromatic necklace that will match everything! a combination worthy of royalty! Check these new pieces out and take advantage of my 20% off sale with code SALE! at checkout. Last autumn a good friend, who is also a maker, ask me to make her a necklace just slightly different from my usual pieces. We worked together to make a necklace perfect for her. 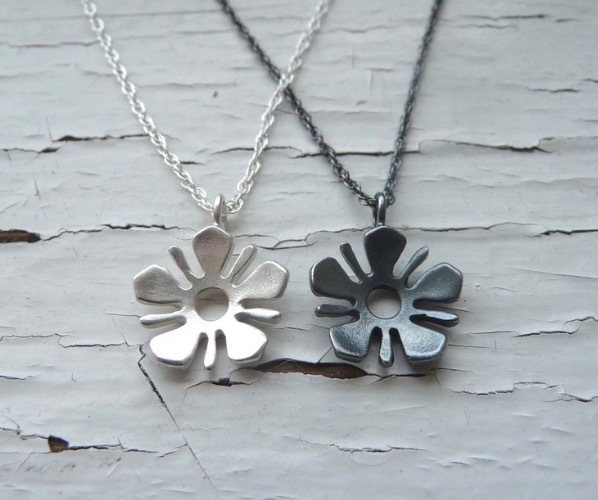 We brainstormed a new shape, that of a petal, and went with a new, simpler chain. While we were at it we made the chain longer, this bigger pendant needs to be shown off! This joint venture reminded me how much I love exploring my craft and executing a new challenge. It really is the start of something new, maybe many things new! Hand-cut shapes. -notice the leaf-shaped pieces, there will be more of those coming soon! hand dapped with handmade wooden dapping punches and block. after fusing a few coats of enamel I soldered a bail to the top. The perfect length to show off this pop of color. Satin finish back and handmade clasps. Since this is the start of a new collection expect more color options and earrings to match. If you have a color request contact me, if you love this necklace as it is buy it here. I am excited to begin this new adventure. One can't help but love what they do when you're customers are this awesome!